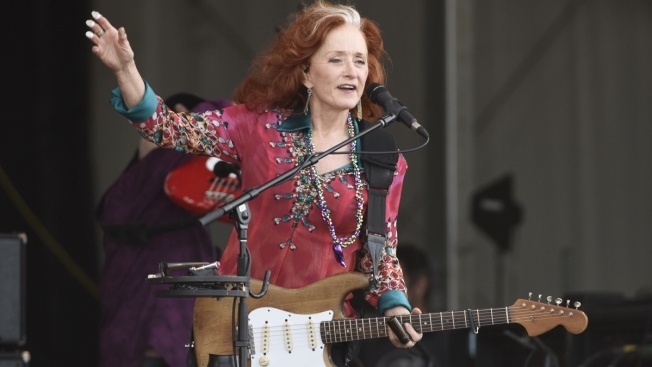 Bonnie Raitt performs during the 2018 New Orleans Jazz & Heritage Festival at Fair Grounds Race Course on April 28, 2018 in New Orleans, Louisiana. Raitt recently announced that due to medical reasons she will be taking a quick break from touring. Bonnie Raitt has pulled out of the first leg of her U.S. tour with James Taylor due to an unspecified "medical situation" that requires surgery. Raitt on Monday posted a statement on her Facebook page apologizing to fans and saying the medical issue arose following her annual physical. She says the prognosis is "good" and a full recovery is expected. The 68-year-old Grammy winner says she expects to rejoin Taylor for his tour's second leg in June and a European tour in July. Raitt's hits include "Something To Talk About" and "I'm in the Mood." She was inducted into the Rock and Roll Hall of Fame in 2000. Raitt asks that she be given privacy and "space to heal."